The Nissan Micra Cup is Back – and visiting Parkway Nissan! 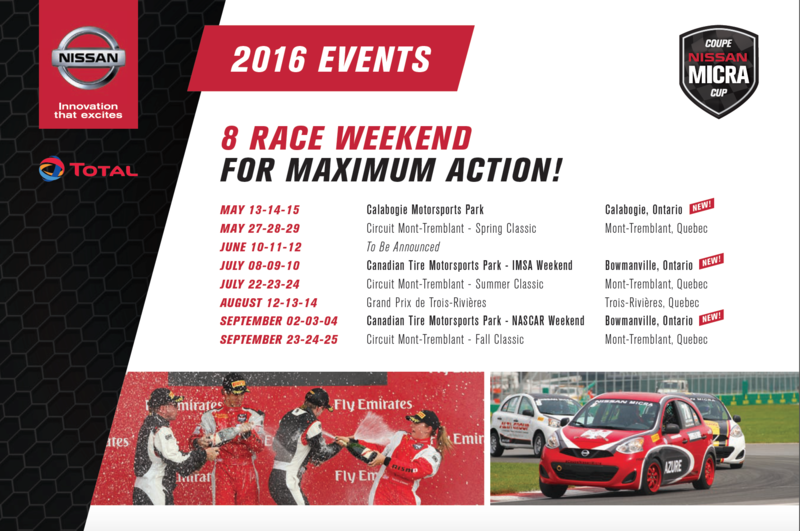 Nissan recently announced the 2016 race calendar for the 2016 Nissan Micra Cup season. The inaugural 2015 season launched exclusively in Quebec. The 2016 Cup will expand it’s eight race weekends to include at least three Ontario events. Canada’s most affordable race series, featuring the most affordable new car, the Nissan Micra, will launch its second season with minor modifications to the rules based on a survey completed by the drivers and their teams. Out of 16 races, the best results will be taken from 12 to tabulate overall standings. The qualifying session for one weekend is now split into two halves, one for each race. The Nissan Micra Cup race cars will no longer require spec fuel, and wheel camber setting will now be free. Due to the expansion of race locations into Ontario in 2016, Nissan Canada has offered Ontario Nissan dealers the opportunity to showcase the Micra Cup race car. The dealer tour is running from March 14-April 14, 2016. Parkway Nissan is hoping to host the car during this time. Our visitors will have the unique opportunity to see up-close, the Micra 1.6S M/T model with minor modifications, including NISMO suspension – to render it race ready. We welcome you to join us for this amazing opportunity! In 2014, the Nissan Micra returned to Canada after 23 years as an all-new model, offering Canadians unbeatable value with the lowest starting Manufacturer’s Suggested Retail Price (MSRP) in Canada at $9,998. The Micra is easy to drive and park, thanks to excellent all-round visibility and turning radius, electric power steering and a power to weight ratio that surprises. Powering the front-wheel drive Micra is a DOHC 1.6-litre 4-cylinder engine rated at 109 horsepower @ 6,000 rpm and 107 lb-ft. of torque @ 4,400 rpm. The 2016 Micra Cup Limited Edition is the perfect fusion between the Micra built for the street and the Nissan Micra Cup race car built for the track, and brings the dynamic look of an official spec series vehicle from the race track to public roads. This Micra Cup Limited Edition is inspired by the official Nissan Micra Cup race car and sports a similar exterior appearance and 15”, 8 spoke, Nissan Micra Cup street edition wheels. Inside, this new model features a unique numbered plaque signed by Olivier Bédard, the first-ever Nissan Micra Cup champion. Only 250 units of the Micra Cup Limited Edition will be produced – available through Nissan dealerships in early spring 2016. To learn more about the Nissan Micra Cup, visit: http://www.nissan.ca/micracup.